Paragon Studios | Come on! Be dramatic! Paragon Studios – Come on! Be dramatic! Paragon Studios, located in Pittsburgh’s North Hills offers training and performance opportunities to ages 3-adult. Tickets for SNOOPY the MUSICAL are now ON SALE! Don’t miss this fun, toe tapping (and actual TAPPING!) show! You will leave the theatre humming these catchy songs. 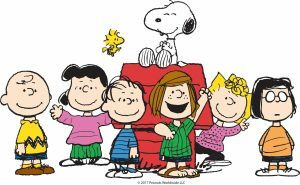 Join Snoopy, Charlie Brown, Lucy, Peppermint Patty and all your favorites for this FUN show! –Intermediate/Advanced acting classes for adults with Jaime Slavinsky is SOLD OUT! Look for another session in the fall! SUMMER CAMP runs June 17-27 with a performance of ALICE IN WONDERLAND at the Kean Theatre on June 27. Ages 6-19. Registration NOW OPEN! $100.00 (4 week period) - Class Full! I'm going to be blasting your page with these ADORABLE photos I snapped at rehearsal last night. I will not apologize. We'll start with the Red Baron.